Cuttings from the craftroom floor: GD for Teddy Bo Tuesday! I am having so much fun guesting with the girls at Teddy Bo after placing runner up in a challenge last month. This week I got to play with one of the new SUPER cute releases. 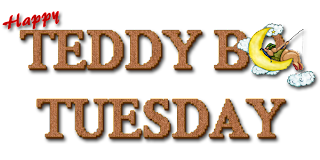 Full details of the release can be found on the Teddy Bo and Co blog and can be purchased from the store. Be prepared to get a few.... one will NOT be enough!! This is what I made with my chosen image. I decided to have a break from the cold and the creepy that I have been doing lately! Stunning as ever missus! **love** the papers you've used and the bunting is really cute.